The biggest problem with the web site is that every time a forum page is opened, the user must wait for the vertical text shifting up and down to settle because of the advertisements on the top before clicking on the desired link. A left click too soon opens the wrong link, then go back and wait again. Even if patience is exercised until it looks like things have settled before clicking, frequently a last instant shift happens, opening the wrong link. Can't the forum be modified to have a large fixed-size advertisement block at the top so all the forum topics below remain at fixed locations, from the initial display to the time when the last advertisement has loaded? It is understood that the vertical height of those ads are not identical, so place an initial Bike Forum wallpaper that is either partially or fully covered by the ads. You might want to try clearing your cookies/cache to speed up your browsing a bit more. If you want to avoid ads entirely, you can also look into a Premium Membership which, among other benefits, will block ads on BikeForums for you. I agree that the add bar that in now on the right side is a pain when using my iPad . I no longer like yout site like I once did. The add moves into the picture when enlarging the view. Do they still make iPads? Apparently they do, but the older models can't use iOS 10 and most older ones can't use 11 so I'm not sure what you are doing messing with the thing. The latest generation of iPads offer nearly 10 inches of screen size which is about 45% of the area of the 22" monitor I'm using right now and I would think that was enough? Pan and scan, I say. More accurately, scroll vertically and horizontally. And by the way, I have a premium membership...The other thing to remember is that you have to be logged in to get rid of the ads that way, the feature relies on cookies. That part failed the Iowa tests in 4th grade. Do you know if you are using the mobile site or the desktop site on your Ipad? If you are running the desktop site, the formatting will not be optimized and will be off. Running the mobile site should take care of that problem. IBThomas There does not seem to be a stand alone Bike Forums app in the app store. I have changed the settings on the bottom left corner of the page from mobile to standard and there is no difference This is a newer problem as I did not have it until recently. I have has pads for a long time Android and Apple. The problem is not there on my desktop or my laptop which has a screen like a tablet allowing me to increase the image size. Here is what is happening,. when enlarging a image on the Ipad or Iphone the add will jump to the center of the screen. It is difficult to get it back on the side where it should be. I tried going to the site from entering it from Google and had the same problem. BikeForums doesn't have an app. 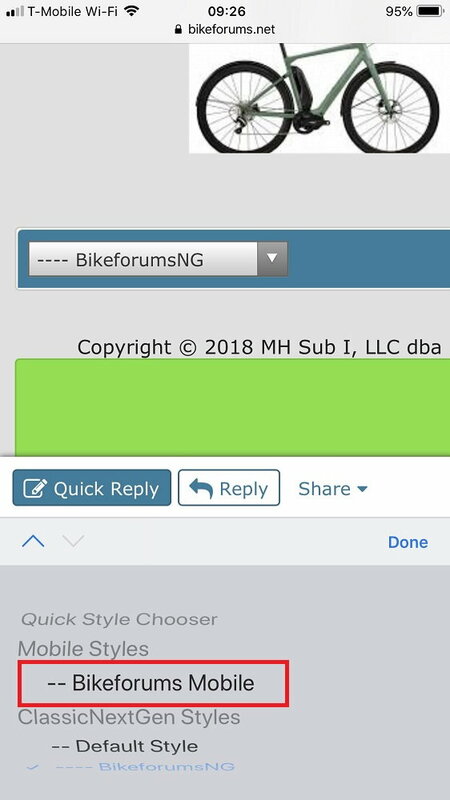 Can you post a screenshot of what BikeForums looks like to you? You shouldn't be using any "standard" view while on on a phone or ipad, use the mobile site and it should be formatted correctly. Make sure you're using the option that I've squared in red. I switched to the mobile at the bottom left. The add problem is gone and the pictures are much larger.